The following posting provides an overview and assessment of the article entitled “Interview with the Web’s Creator”, Tim Berners-Lee (now Sir Tim Berners-Lee). The article was written by Chris Oakes, who was a staff writer at the time and is now a freelance business writer based in the Paris, France area (LinkedIn, n.d.). The interview appeared in Wired magazine on October 23, 1999, shortly after Berners-Lee (1999) released his book, Weaving the Web. The timing of the book is interesting: it appeared ten years after Berners-Lee introduced the concept of what the article calls a “global hypertext project” in the course of his work at the European Particle Physics Laboratory in Geneva, Switzerland. The following is a brief timeline of the beginning of the web summarized from A Little History of the World Wide Web (http://www.w3.org/History.html, n.d.) and information in the Wired article. Note that it wasn’t until 1993 that Berners-Lee seems to have breathed a sigh of relief that the Web wouldn’t fragment and not become the integrated and accessible tool he envisioned – although tool seems an inadequate word for something so powerful. Doug Engelbart “prototypes” a system (NLS) that does hypertext browing, editing, email, etc. The word hypertext is used by Ted Nelson in 1965. Others build on their work. Tim Berners-Lee writes a program “which allows links to be made between arbitrary nodes”, each of which had a title and two-way, typed links. Tim Berners-Lee proposed the global hypertext project in 1989 and in 1990, his boss okayed a project allowing him to write the system. The project was released to users and various gateways and mailing lists, etc. began. By December, the project was presented at a conference called Hypertext’91. A series of technical advances were made and use of the internet, as well as new nodes and protocols continued to be released. In the interview, Berners-Lee calls the growth over this time exponential and says that until 1993, he and presumably others were never certain that the growth wouldn’t stop, or that the Web wouldn’t fragment into different systems which weren’t well connected. Accessibility spreads beyond institutions and people begin to talk about bringing the Web into homes. People start leaving the research institutes to start dotcom companies, but Berners-Lee continues to work in public institutions. The Web wasn’t seamless; different browsers used different versions of HTML. The International WWW Conference Committee is founded to guide the Web. Usage grew 1000 times from that recorded only three years earlier. Berner-Lees says in the interview that he doesn’t mind being called the inventor of the Web, and then in the same breath, eschews any trappings of celebrity because of its damaging effects on private life. He comes across as a very secure, altruistic individual, neither without ego, nor falsely modest. When he founded the World Wide Web Consortium in 1994, he did so with the objective to ensure that the Web stayed accessible. And it appears he’s succeeded: As Kate Milbury said in our lecture yesterday, the internet is still not completely commodified by business or controlled by government (personal communication, April 30, 2012). Times Magazine has named his as one of the greatest minds of the last century, saying “Unlike so many of the inventions that have moved the world, this one was truly the work of one man…the World Wide Web is Berners-Lee’s alone. He designed it. He loosed it on the world. And he more than anyone else has fought to keep it open, non-proprietary, and free…It’s hard to overstate the impact of the global system he created. It’s almost Gutenbergian. 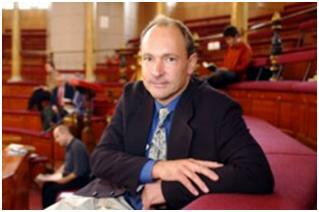 He took a powerful communications system that only the elite could use and turned it into a mass medium” (http://www.w3.org/People/Berners-Lee/Weaving/Overview.html, March 17, 1999). Berners-Lee raises questions about the future of the internet in the article and points out dangers that he saw at the time. Interestingly, I don’t believe that thirteen years later, his questions have been fully answered or his concerns wholly put to bed. He said at the time that fragmentation of the web could still occur and we continue to see barriers put up by companies like Amazon with their proprietary Kindle e-books, Apple with its tethering and refusal to allow Flash, and sites that slow down access to competitors, for example. All of these are barriers to the seamless flow of information. In a way, these also seem to be creating the condition he warned about where use would be inhibited by the requirement to “use this software” or “you must get a particular piece of hardware in order to follow this link” (Oakes, 1999, para. 21). For example, I tried to link to information on Chris Oakes housed on LinkedIn, but the program changed the URL from Oakes address on their site to my login page. Another example is copyright being used as a way to inhibit creativity and control what in the web world seems like fair use. The comment is made as well that applications at the time were built “fairly thinly on the web”. In 1999, the dotcom bubble had yet to burst and it was almost five years before the term Web 2.0 was coined to describe the evolution of the internet to being a platform built around services and not packaged software, participation, software that was designed for more than a single device and a way of ‘harnessing collective intelligence (O’Reilly, T., 2005). So it was a fair observation and we see now how the applications have been integrated deeply into the idea of the internet. “Web 2.0 is a stovepipe system. It’s a set of stovepipes where each site has got its data and it’s not sharing it. What people are sometimes calling a Web 3.0 vision where you’ve got lots of different data out there on the Web and you’ve got lots of different applications, but they’re independent. A given application can use different data. An application can run on a desktop or in my browser, it’s my agent. It can access all the data, which I can use and everything’s much more seamless and much more powerful because you get this integration. The same application has access to data from all over the place” (Miller, P., 2008). And once again, Sir Berners-Lee has explained a difficult concept in a way that I understand. That’s probably the biggest challenge I had with the information dealt with in the article: while it was an easy read, when I looked to other sources to understand the concepts more deeply, the technical nature of the information was daunting, including information on the seven layers of the web. When I went to look for an understanding of the semantic web and RDf, I had to click and click before someone really defined them in a way I could understand. So let me add clear and well spoken to the list of adjectives I would use for Berners-Lee. No wonder he could write the code for the web; he can think deeply and clearly and express those thoughts in ways that bring others on board. In the article, Berners-Lee protests that the web remains a work in progress, despite people saying to him at the time that it was done. The web is still not done, and as long as people continue to create and invent and interact, it seems difficult to envision a time when it will be done. Becoming literate in social media and all the skills the web requires is a challenge indeed! I take it one tweet at a time! And always remember to ask: why am I doing this? Great post! You rocked the presentation today, Judith. With an open system like the web, and the necessity to have user-generated content, it will never be done until we stop creating/contributing/inventing. I totally agree with Kate – it’s up to us to decide what is meaningful to us and nurture our own little piece of it. I agree. I blogged on this theme again this evening; that the web can enhance humanity. Thanks for the feedback.